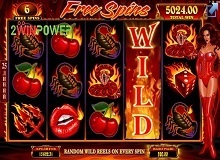 Red Hot Free Spins is a Halloween-themed video game from Amaya. The game comes with 243 ways of pay and 5 reels. It is a medium to high volatility game that has Wilds and Scatters in addition to a bonus turns feature. Everything from the graphics to the music is set to throw players into the dark fiery world of death. Expect the raw metallic music to welcome you to the game and keep you company as you strive to make a winning. The music is so aggressive; you will be transported to a horror-packed atmosphere complete with horrific graphics! 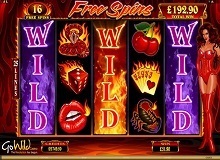 Among the characters that make up, Red Hot Free Spins include the devil’s trident, lips with fangs, a halo, hearts with wings as well as devil horns. Players can also look forward to the face of a woman that is adorned with devil horns, and the image of a woman dressed in suspenders, stockings as well as a red corset. To complete the woman’s look is the devil’s horns and tail. Everything is designed in such a way as to transport players to a version of hell! Players can wager starting from 0.01 and up to 0.10. In addition, multipliers can be chosen in the range of 1x to 10x. The maximum amount that can be wagered on any given spin is $250. The Wild symbol can appear as the devilish face of a woman. The devilish face of the woman is also what is used to represent the Scatter symbol. The RTP percentage for the game is 94.98%. How to Get the Upper Hand in Red Hot Free Spins Slot? The Wild symbol in the game is represented by the devilish face of the woman. This symbol can pop up only on the 2nd and 4th reels. 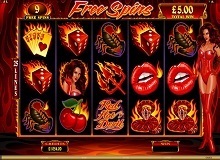 The devilish face of the woman is also used to represent the Scatter symbol in Red Hot Free Spins. When unlocked on the screen, the Scatter symbol can pave the way to the bonus turns feature. In order for this to happen, the Scatter symbols need to appear on the reels 3,4 and 5 simultaneously. If you happen to unlock five Scatter symbols on any reels, then you will be awarded 100 coins. Last but not least, there is a triple winning effect to look forward to in Red Hot Free Spins. In order to arrive at it, 3,4 or 5 have to make an appearance together. When this happened, you will be presented with 15 bonus turns with a chance at tripling your winnings for the round! As if that is not enough, there is also a possibility of re-triggering the bonus turns! How to Turn the Hot Red Flames to Good Winnings in the Red Hot Free Spins Game? Red Hot Free Spins does come with an interesting bonus round. What makes this round interesting when you play Red Hot Free Spins slot machine online is the fact that there are 15 bonus games to look forward to. In addition, players get to enjoy triple the prize and a re-trigger feature in the event that three Scatter symbols happen to land anywhere on the screen. The re-triggering effect in Red Hot Free Spins will definitely improve your odds of getting a decent win. You will be glad to know that if you opt to play Red Hot Free Spins for real money, then there is a possibility of enjoying high payouts. If you happen to land the symbol of the devil woman, then you stand a chance of winning big. If you happen to spin 5 matching devil woman symbols on your screen, then you stand of enjoying a maximum of 50,000 coins! Besides the devil woman in Red Hot Free Spins, the other symbol that lets you enjoy high payments is that of the heart with devil horns. This symbol is capable of getting a maximum of 30,000 coins if a maximum bet is placed and 5 such symbols are matched. Following the heart with devil horns is the heart with the halo. This symbol in Red Hot Free Spins casino slot online lets you enjoy a maximum of 20,000 coins. Other symbols then follow, for example, the vampire lips get you a maximum of 10,000 coins, the devil’s trident is good for a maximum of 5,000 coins. The Ace high card, on the other hand, is good for 2,500 coins. The rest of the symbols (Queen, King, Jack or 10) will get you anywhere from 200 coins to 2,000 coins. If aggressive horror-themed games are what moves you, then you should definitely consider Red Hot Free Spins. This is a 5-reel game comes with 243 paylines and an RTP percentage of 94.98%. This medium to high volatility game has a bet value of 0.01-0.10. There is also a great bonus turns’ reward feature that can be re-triggered to make for good winnings. Ultimately, even when you play Red Hot Free Spins free, it is a game that will keep your heart pumping as you are presented with one horror-laden scene after another!